How to write your last will & restament to avoid estate taxes. Redirect your tax dollars way from CRA to charitable causes that matter to you! Todd O’Relly, Investment Advisor, RBC Dominion Securities and Les S. Scholly, Lawyer – Pritchard and Company, LLP will take you through a comparison based approach to reducing your overall estate tax bill through giving to your community. The even is free, so invite your friends, family and colleagues. 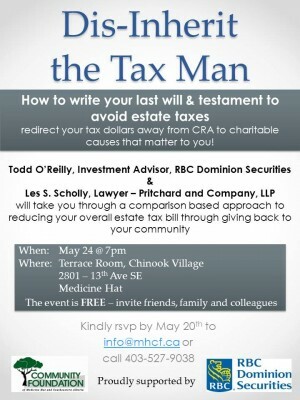 RSVP by May 20th to info@mhcf.ca or call 403-527-9038. Proudly supported by RBC Dominion Securities and Community Foundation. This entry was posted on Thursday, May 12th, 2011 at 9:30 AM and is filed under Non-Profit, Other Events. You can follow any responses to this entry through the RSS 2.0 feed. You can leave a response, or trackback from your own site.